El Cid - Castilla Hotel - Relax! All rooms and suites have air conditioning and ceiling fans, wireless Internet access, coffeemaker, an in-room safe, a private balcony, satellite TV, an iron and ironing board, direct-dial phone, radio alarm clock, and purified water. The marble bathroom features a shower, bathtub, hair dryer, and bath amenities for your convenience. 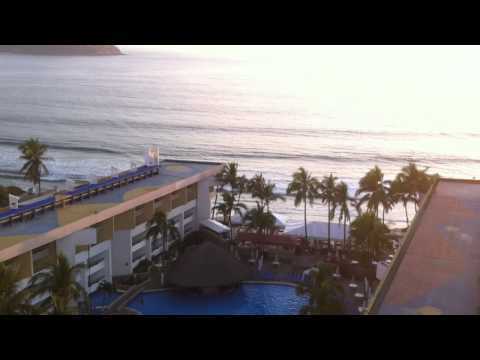 Ocean View King/ Ocean View Double -- Enjoy Mazatlán’s breathtaking sunsets from the private balcony in our Ocean View King and Double Rooms. Located in the 15-story tower, our spacious rooms feature a contemporary, tropical-style decor. Maximum occupancy: 4. Ocean Front King/Ocean Front Double – Take in magnificent sunsets, pristine beach, and the soothing sounds of the surf from the private balcony in our Ocean Front King and Double Rooms. These spacious rooms are located in the low-rise, 4-story wing, directly on the beach, and have a tropical-style decor. Two Bedroom Suite – Unwind and relax in the spaciousness of our Two Bedroom Suite, ideally located in front of our magnificent beach. Sit on your expansive balcony and take in unique views of the sun setting on Deer Island. Comes complete with a kitchenette. Maximum occupancy: 8. Three Bedroom Suite – Relax in the spaciousness of our Three Bedroom Suite, ideally located oceanfront. Sit on your expansive balcony and take in unique views of unique sunset views while listening to the surf. Stretch out in the living room, dine in the kitchenette, or unwind in your own Jacuzzi and sauna. Two bedrooms feature a King bed and the third has two double beds. The suites each have individual climate control air conditioning and a ceiling fan. They also have wireless Internet access, coffeemaker, an in-room safe, a private balcony, satellite TV, an iron and ironing board, direct-dial phone, radio alarm clock, and purified water. Maximum occupancy: 10.